If I did my job well during Bacon Month (August), you’ve been motivated to make your own home-cured and smoked bacon from scratch (see my easy-to-follow directions here). You’re up to speed on how to grill bacon-wrapped foods, from onion rings to chicken drumsticks. So who first had the idea to apply the classic over-and-under weaving technique to strips of cured pork belly, a.k.a. bacon? I wish I knew (if you do, please let us know). But the technique went viral in December 2008, when Kansas City, Missouri, competition barbecuers Jason Day and Aaron Chronister began promoting their now famous trademarked “Bacon Explosion.” (Chronister, an experienced Internet marketer, strategically positioned the phenomenon in the cyberspace fast lane.) 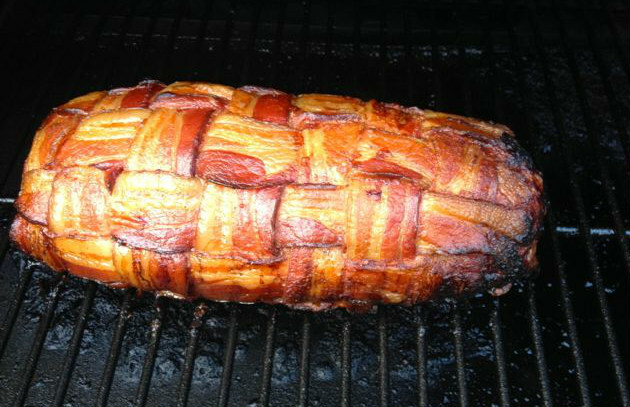 The men are quick to admit, however, that they didn’t invent the bacon weave. The weave may look intimidating, but—trust me—you can master it in 5 minutes. (If you’ve ever made a lattice weave crust for a pie or woven a potholder at camp, you can do it.) Click here for step-by-step instructions accompanied by photos. Make mini bacon weaves to top grilled hamburgers. (Simply cut bacon strips in half crosswise before weaving.) The weaves can be made ahead: Indirect grill them over medium heat (about 350 degrees), until crispy and golden brown, 15 to 20 minutes. Drape bacon weaves over lean poultry like whole chickens, turkeys, pheasants, etc., to keep them from drying out during grilling (indirect) or smoking. Top a smoke-roasted apple pie with a loose bacon weave lattice crust before indirect grilling or smoke-roasting. Be amazed what smoke does to fruit. Wrap beef brisket, pork loin roasts, pork tenderloin, game meats (like venison backstrap), or meatloaf with bacon weaves before grilling or barbecuing. Think out of the box. Indirect grill a bacon weave to make: a pizza crust, taco shell, or base for a quesadilla. Trim the weave to size while it’s still warm using a sharp knife or kitchen shears. Cook it draped over an overturned bowl or pie plate to make a bacon bowl. If you have other ideas, please share them with us on the Barbecue Board. 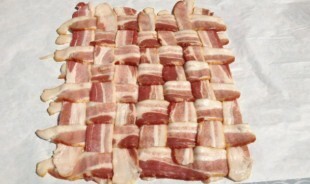 Get detailed instructions and tips for building the best bacon weave, and try the Fattie recipe.